Actually, using the term 'studio' here is being very generous. A utility sink, a countertop; that's about it. My painting area is certainly modest but I'm more than content with it. 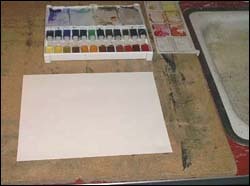 As a matter of fact, my setup hasn't changed much since I started painting with watercolors back in the 1970s. I prefer a large container for my main water source so for years I've been using an ice bucket (right) from an old refrigerator. 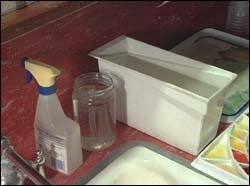 The glass jar is for rinsing the brush between colors (since it's important to change the water often to avoid muddying the colors). 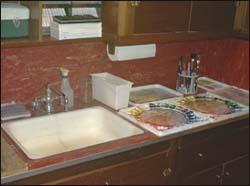 The spray bottle is useful for moistening the paint in the palette wells, although I often rotate the palette under a dripping faucet to achieve the same result. 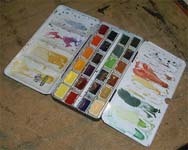 For many years I used tube paints exclusively, squeezing out just enough color to complete the task at hand. These days I use both tube and pan formats (I even have a couple of watercolor jars around here somewhere) and now I'm inclined to fill the wells in a palette, even if I won't use all the paint until later. 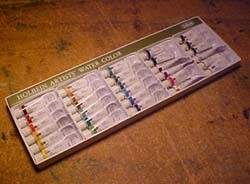 The St. Petersburg watercolors from Yarka aren't bad and they certainly are a bargain. 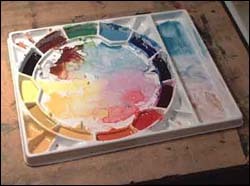 Their palette is designed for painting in the field, so I cracked open the pans and put the colors in a Quiller palette, an arrangement I prefer for studio painting. 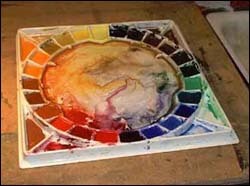 Many of the colors appear very dark in the pans, so it helps to make and consult a color chart. 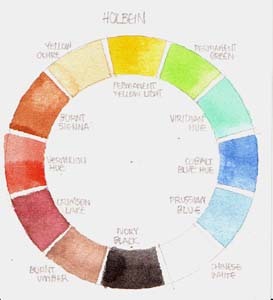 I got my first set of Holbein colors a few years ago and I've really enjoyed using them. Demo 5 below was painted using the 12-tube set shown here (this is the corresponding color chart). 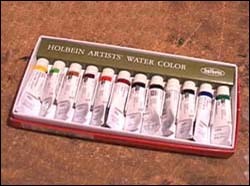 In November of 2006 I was thrilled to receive a set of thirty Holbein Colors from the Philadelphia Watercolor Society as part of the H.K. Holbein Award. I received a nice set of Winsor & Newton watercolors from the Placerville Arts Association as part of the Winsor & Newton Award. 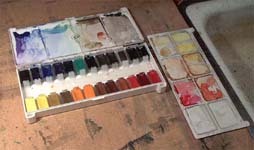 Demo 6 below was painted using this palette. Here is the color chart. 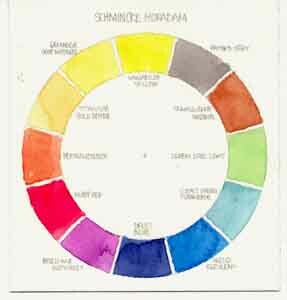 My favorite watercolors are from Schmincke Horadam; they are expensive but very good. 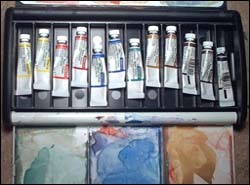 Once I'd accumulated a dozen tubes, I started putting the paint into a 12-well Quiller Traveler palette. This is the corresponding color chart I made with a piece of scrap paper. I eventually splurged and purchased a 24-pan set from Schmincke. 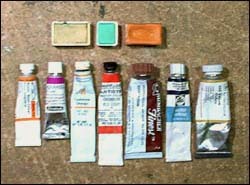 I rarely stray from the line-up at the far left: a one-inch flat brush (which I use about 99% of the time), a 5/8-inch flat brush and an old toothbrush for spattering paint. 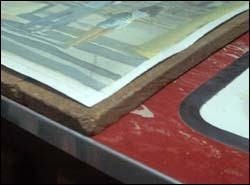 On larger paintings I sometimes use the mop brush (inset) for laying in washes. 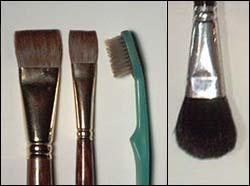 I prefer sable, but squirrel brushes seem pretty decent too. I'm not crazy about pure synthetics, but some blends are acceptable. I've accumulated a number of brushes over the years, including quite a few rounds, but they seem to sit in the stand for months at a time. 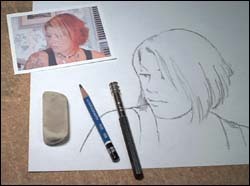 It seems that most details can be successfully painted using the edge or corner of a flat brush. 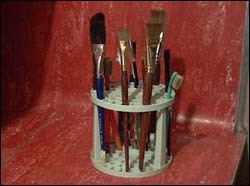 Seeing this picture reminds me: always let the brushes dry horizontally before placing them in a vertical stand. 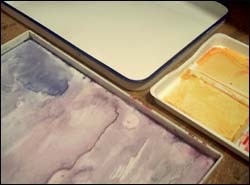 It's nice to have plenty of room available for mixing colors and preparing washes, so in addition to the center areas in my paint-filled palettes, I use a porcelain butcher's tray and various palette lids. 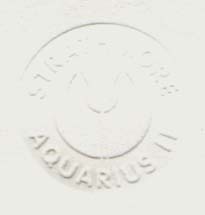 The stock I use most often is Strathmore Aquarius II, an 80 lb. blend of cotton and synthetic fiber that really does resist buckling as advertised. Some artists dislike this product because it lacks the texture of traditional watercolor paper, but at this point I'm accustomed to the smooth surface. For years I used an entire 22x30 sheet for each painting, but eventually I started tearing them into quarters to make smaller works. 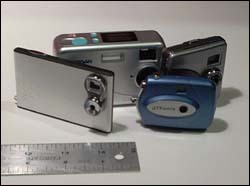 For years I used these tiny, inexpensive digital cameras to bring location pictures back to the studio (now I use my cell phone). The low-resolution images that result might not qualify for your family photo album, but they're good enough for reference. Check out Demo 1 below for an example. I was never very particular about what sort of pencil I used for my initial drawings, but somewhere along the line I acquired a box of Mars 6B Lumographs and now I'm sold on them. An extender (right) allows you to use each pencil down to the very end. A good eraser is important too, so I always have a Sanford Magic Rub nearby. The surface I paint on is the same 24x36 panel of particle board I've been using for almost forty years; I might as well hold onto it a while longer. When I paint with acrylics I use a traditional easel set a few degrees off vertical, but for watercolors I always keep the surface completely horizontal.